Happy Friday Friends! I’m so excited today to be participating in the Virtual Progressive Thanksgiving Dinner and today I’ve got an oh-so-yummy pumpkin dessert to share with you guys. 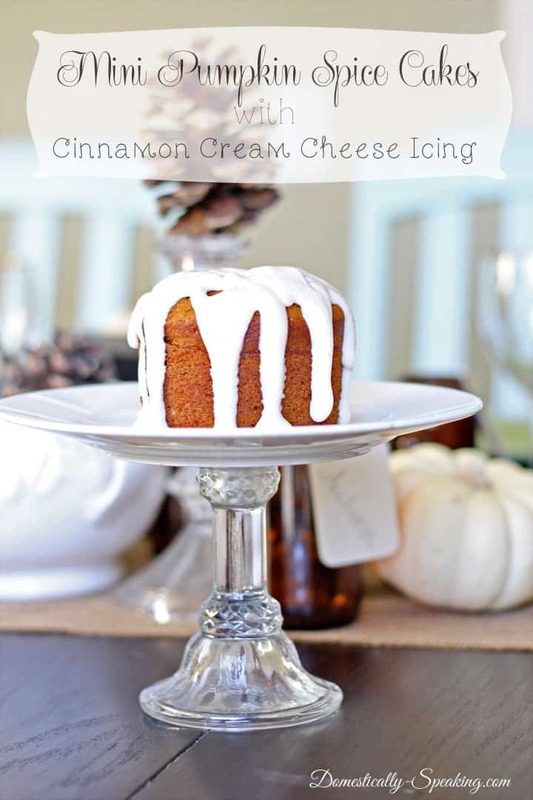 Mini Pumpkin Spice Cakes with Cinnamon Cream Cheese Icing … are you drooling yet? Mini food is so fun! 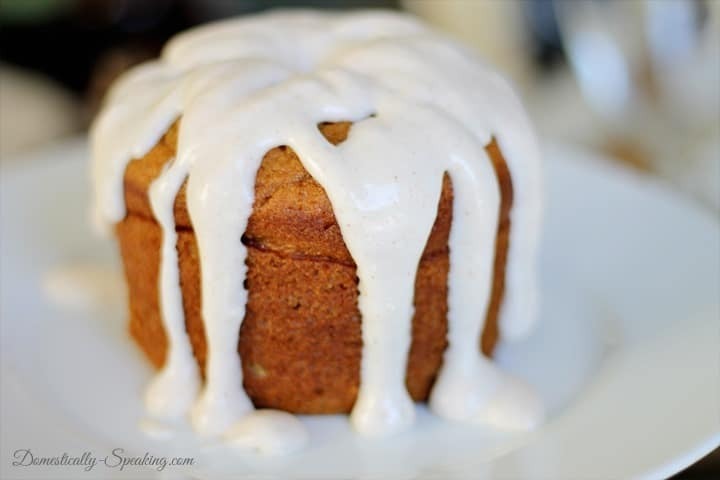 These pumpkin spice cakes are moist and full of delicious fall flavors and paired with rich cream cheese icing with a hint of cinnamon is perfection. One of my favorite parts of fall are the pumpkin treats and these do not disappoint. 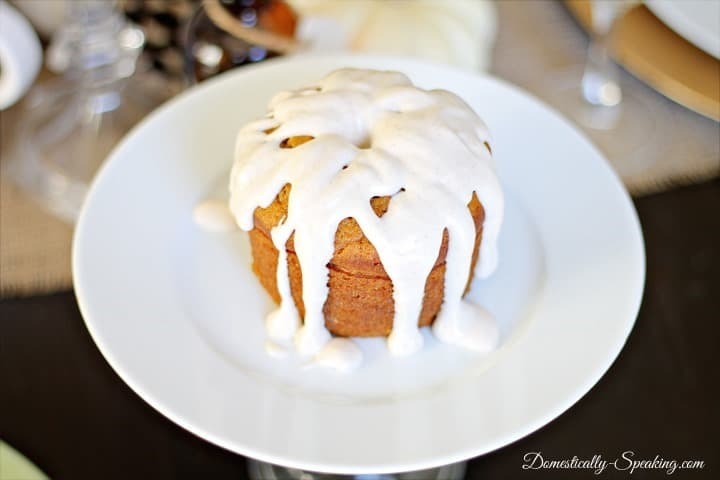 Mini Pumpkins Spice Cakes with Cinnamon Cream Cheese Icing are a great dessert option on Thanksgiving for all the pumpkin lovers. Here’s the yummy recipe and below you’ll find everything you need for your Thanksgiving dinner from décor, to recipes, centerpieces, printables and more. You don’t want to miss out on what all these awesome ladies are sharing! These mini pumpkin spices cakes are a delicious treat and wonderful topped with a cinnamon cream cheese icing. Combine the first five ingredients (dry ingredients) in a bowl and whisk till combined. In a mixing bowl, add the eggs, pumpkin, sugar and oil. Mix on low to medium-low speed till combined. On low speed, add the dry ingredients to the mixer. Mix till combined. Spray your mini bundt pans with spray oil. Pour batter into pans and fill to approximately 3/4 full. Bake at 350 for 20-25 minutes. Let cool for 10 minutes before using a butter knife to loosen around the outside of the cake pans. Dump over and let them cool. Add cream cheese and butter to a mixing bowl and beat on high for 1 minute. Add powdered sugar and mix on low till combined and then on high for 1 minute. While the mixer is on low, slowly drizzle in the milk. Mix till combined. Add cinnamon and mix till combined. Thanks for stopping by friends & have a wonderful weekend! Yum! 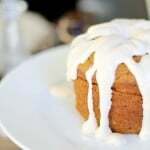 Can you make this in a big bundt pan instead of mini ones? Absolutely Karen! It also makes a great sheet cake. That’s usually how I’m make it for a large group. Maryann, Anything pumpkin is a favorite of mine, but these are beyond. So adorable and delicious. Thank you for sharing another way to use pumpkin! 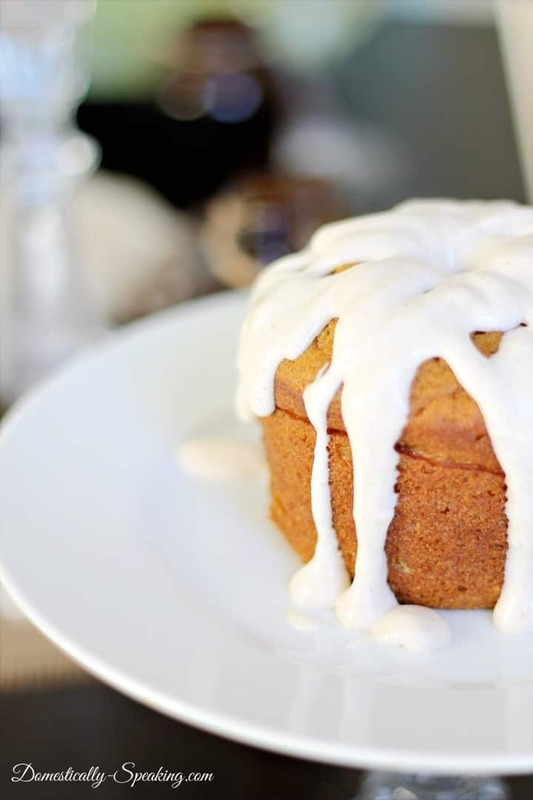 Mmmm that looks so yummy – thanks for the recipe, Pinning! They’re almost too cute to eat … almost!! Love these! Can’t wait to pin them. There’s just something about little individual cakes. Happy Thanksgiving! I absolutely love mini desserts and this one looks so delicious. Definitely pinning this recipe for later. So excited to be part of the dinner with you. This looks yummy! Have a great weekend! Pumpkin spice and cake! Yes, please. I’ll take extra cream cheese icing too. love it! This looks so good! I’d much prefer cake over pie for dessert and need to talk my mom into making this for our dinner. Maybe I’ll make it and she won’t have any choice but serve it! Those look like the perfect fall dessert!